So yeah, here is my creation for the challenge Anything Goes. I used my copics to color this cute little cub running his heart out. It reminded me of so many resolutions that we all have such wonderful intentions of completing in the forth coming year. And why not give a person a little uplifting gift or even a handmade card to uplift their new resolutions into the New Year. How did you spend your New Years? I spent mine in the hospital passing kidney stones and yes.....I want sympathy...lol. Those darn things hurt. I had never tried to do the sunburst background and I loved putting it together. It was super easy and very cute....even though you can only see a wee bit of it. I certainly hope to do it again. The sentiments for this card came from my brain. 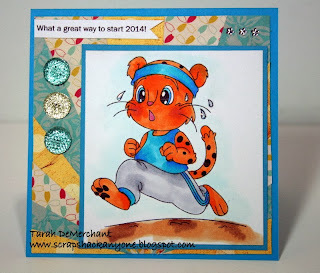 The outside of the card says: WHAT A GREAT WAY TO START 2014! The inside says: KEEP UP THE GREAT WORK. I thought of a friend who started running again after a few years off ~ she is doing marvelous and I am sure one of her resolutions will be to accomplish something running this year. Best of luck to her and all those peeps out there in the world trying to do their best at whatever resolution they choose to do.